Back cover blurb: Life isn’t an exact science. Things can be troublesome. Like pregnant step-mothers, the ins-and-outs of French existentialism . . . having an unexceptional name. Eighteen-year-old Sue Bowl is no stranger to life’s wobbles. When she rushes home from her creative writing course in Greece to meet her new-born baby half-brother, she wonders if she’ll ever get the chance to make it big in the world of literature. Still, she has lovely boyfriend Joe and new sibling Pierre – and who else will help Aunt Coral keep the damp at bay at crumbling home Green Place? But when the bright lights of the big city start sparkling, and Sue Bowl catches the eye of a literary wunderkind, life begins to take an unexpected turn . . . A witty and enchanting novel about what happens after you think you’ve grown up and fallen in love, perfect for fans of I Capture the Castle, Love, Nina And Where’d You Go Bernadette. 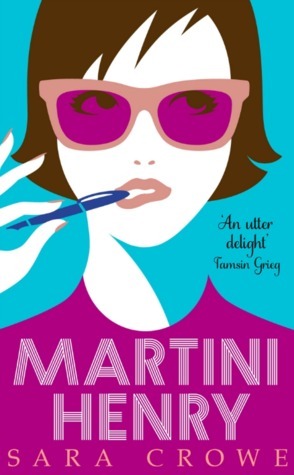 Martini Henry is the first novel of Sara Crowe's that I've read, a lovely journey of a novel through the late 1980s with Sue Bowl. Sue Bowl is an aspiring writer, the year is 1988 and she is taking part in a writing course abroad. All is going swimmingly, she is writing well, and making some amazing friends, in fact Sue's life is pretty perfect until she is called home for the birth of her baby step-brother. Martini Henry is told in a journal style and reminded me - a little, of Adrian Mole. As Sue chronicles affairs of the heart as well as tales of her every day life. We learn about her beloved Aunt Coral and the once great house (read Mansion) that they live in. The lodgers that they are forced to take in to make ends meet, and the discovery of something remarkable in their back garden. Martini Henry is a slow burner of a novel that I suspect won't be everyone's cup of tea, but it is worth persevering in my opinion if you are unsure at first. Martini Henry is available now from Amazon online and all good book shops.